Yeah, so apparently Epona's Song has lyrics? Actually, I only found out the English translation after I painted this, so it's cool that it fits. Sorta. I'm not sure what made me do this, I just kinda felt like it. I had a lot of trouble with Malon's pose...it still looks kinda funky. 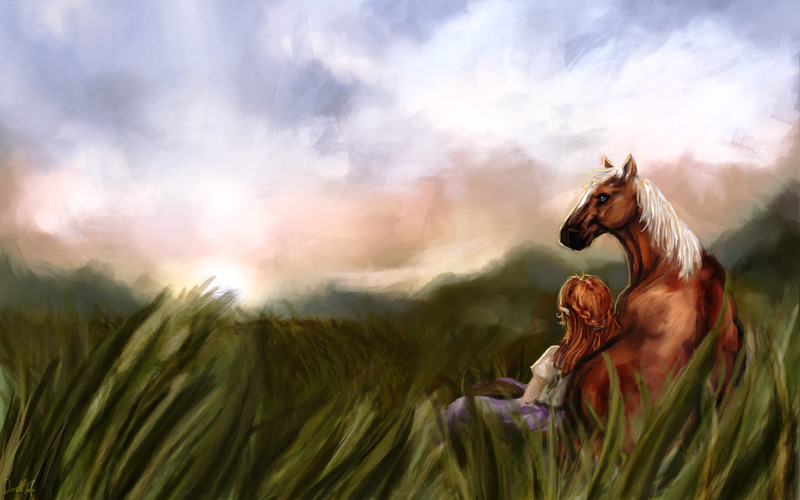 though Epona was a lot easier to draw than I expected. Also my first wallpaper for who knows how long and the first substantial background. My dear artist you did a splendid job ! wow incredible talent for painting! I love the grass, the blue eye of the horse wonderful! so realistic.. it really looks like a real painting... i love ittt..
You are amazing!Really great work! So nice to see someone post a wallpaper with a horse! I don't even like horses, but I think this wall is epic. Amazing skill, and gorgeous work. Fav-o!